I was sent this beautiful, heavenly blush in my swap with Megan who co-runs Min and Megs. I had asked for the Tarte Amazonian Clay blush in shade Tipsy, but Sephora didn't have it in stock, so instead Megan got me Dollface (which I also love and will be reviewing soon) and to replace Tipsy which she couldn't get me, she told me she was sending a Milani baked blush. At the time I had never heard of the brand but I was happy to try it out. When it arrived, boy oh boy, the part of me that wasn't still craving Tipsy (which I will find a way of getting) was so happy she sent this instead. It is just utterly beautiful and still after weeks of having it in my ever growing makeup collection, I can't stop 'ohhhhh'ing and 'ahhhhh'ing at it's beautiful-lovely-ness. So why am I so in lust with this blush? Well for starters, it's not your typical shade of blush. I've been trying to break myself in to wearing more blushes but the shades I have previously bought are still, for someone not really overly confident wearing blush, quite intense. Whereas this is a beautifully understated golden coral shade with just the slightest undertone of pink pulling through. It's light, delicate, and I think, not too far off of my natural skin tone. So when I wear this, it just looks as if my cheeks are naturally flushed, which is something I have really struggled to find with any other blush I have tried, and I now have a lot!! It's so easy to blend, the colour can be built up and it sticks around all day. I just love it. Love it, love it, love it! There are actually quite a few baked blushes from Milani I want to add to my collection now, particularly Coralina and Rose D'oro. I also wanted to try their baked bronzer, in shade golden. Oh how I wish they sold Milani here in the UK. But I know without a doubt that this is a brand I will pay the International shipping for. 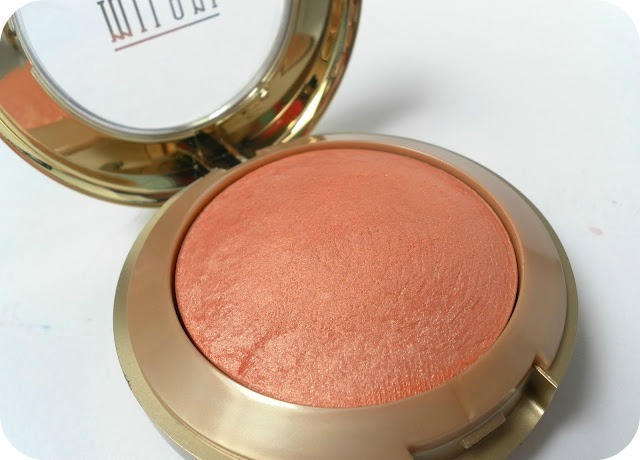 Because this blush, is the first blush I have felt truly comfortable and confident wearing! You can also buy Milani baked blushers (along with a ton of other Milani stuff) from www.beautyjoint.com and they retail at $7.99 which is about £4.48 at the moment. p&p is only £2.82 if you go by weight and you can insure it for also. I'm buying some wet n wild stuff from there soon. This looks like such a gorgeous colour, I can imagine that it looks amazing on! Wow, I must admit this looks absolutely beautiful. It's a really unique shade too, and looks great against your skintone. The only products I've tried from Milani so far are nail polishes, looks like I've been missing out. I may have to get this one, it's a gorgeous colour! Yay! Glad you like it so much!